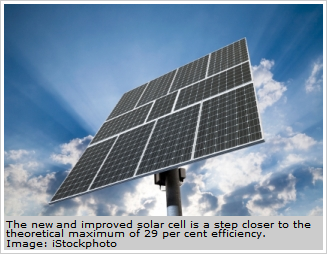 In the land down under, comes some positive news on the energy front: World's most efficient solar cells created. The University of New South Wales’ ARC Photovoltaic Centre of Excellence has reported the first silicon solar cell to achieve the milestone of 25 per cent efficiency. The UNSW ARC Photovoltaic Centre of Excellence already held the world record of 24.7 per cent for silicon solar cell efficiency. Now a revision of the international standard by which solar cells are measured, has delivered the significant 25 per cent record to the team led by Professors Martin Green and Stuart Wenham and widened their lead on the rest of the world. Professor Green said the jump in performance leading to the milestone resulted from new knowledge about the composition of sunlight. “Since the weights of the colours in sunlight change during the day, solar cells are measured under a standard colour spectrum defined under typical operational meteorological conditions,” he said. Dr Anita Ho-Baillie, who heads the Centre’s high efficiency cell research effort, said the UNSW technology benefited greatly from the new spectrum “because our cells push the boundaries of response into the extremities of the spectrum”. “Blue light is absorbed strongly, very close to the cell surface where we go to great pains to make sure it is not wasted. Just the opposite, the red light is only weakly absorbed and we have to use special design features to trap it into the cell,” she said. By turning a long line of mirrors, the first solar thermal plant in nearly two decades was launched last week in Bakersfield, California. Unlike solar photovoltaic systems that convert sunlight into electricity, this plant will focus sunlight on tubes that contains water. The light heats the water, creating steam, thus turning turbines. 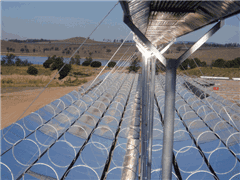 Solar Thermal Electricity is finally Catching the Eye of Utility Companies. The American Southwest has some of the greatest solar resources on the globe, it yet remains largely untapped. This trend may be changing as solar technology matures, market forces shift and concern for climate change mounts. One of the most common arguments against large-scale use of renewable energy is that it cannot produce a steady, reliable stream of energy, day and night. Ausra Inc. does not agree. They believe that solar thermal technology has the potential to supply over 90% of grid power, while finding solutions to environmental issues. The ability to utilize solar thermal technology after the sun sets is made possible by a storage system that is up to 93% efficient, according to Ausra’s executive vice president John O’Donnell. Heat storage is not a new technology, having been used for plastic manufacturing and petroleum production for a long time. Solar thermal plants have a cost advantage compared to photovoltaic technology because energy can be stored as heat without being converted to another form or relying on batteries. Due to cost, infrastructure and technology hurdles, it will be a while until we see solar energy generating large-scale base load capacity, thus replacing nuclear and coal power plants. Some of the factors that will push this along are a strong national high voltage transmission system, solar technology advances, high fossil fuel costs, a longer-term extension of the commercial solar tax credit, and a carbon tax. Ausra Inc., the developer of utility-scale solar thermal power technology claims Solar Thermal Power Could Supply Over 90 percent of U.S. Grid Plus Auto Fleet. "The U.S. could nearly eliminate our dependence on coal, oil and gas for electricity and transportation, drastically slashing global warming pollution without increasing costs for energy," said David Mills, chief scientific officer and founder at Ausra. "This new study shows that our daily and annual energy needs closely match the energy production potential from solar thermal power plants with heat energy storage, and our models show solar thermal power will cost less than continuing to import oil." "Near-zero pollution technology has to replace most of our current electricity generation by mid-century to prevent the worst global warming outcomes," said Stephen Schneider of Stanford University, who was a principal author of the 2007 Intergovernmental Panel on Climate Change Synthesis Report. "We've got to cut pollution 80 percent by mid-century, and that means transforming both our electric power and transportation sectors." The problem I have with Ausra's claims is they depend on a commercial solar tax credit, a carbon tax, land rights, and infrastructure that is not yet in place. Here is the key paragraph. "Due to cost, infrastructure and technology hurdles, it will be a while until we see solar energy generating large-scale base load capacity, thus replacing nuclear and coal power plants. Some of the factors that will push this along are a strong national high voltage transmission system, solar technology advances, high fossil fuel costs, a longer-term extension of the commercial solar tax credit, and a carbon tax." However, the time is coming when those issues go by the wayside. Eventually those problems will be solved or peak oil will force the issue.